I make this in the fall, using a couple of leftover vanilla cupcakes for the topping, and serve it with nondairy ice cream or whipped topping. It’s the easiest thing to make, especially because I usually keep unfrosted cupcakes in the freezer, because you never know when you might want a quick treat or to use them for something else. The addition of the apple butter eliminates the step of adding spices. I prefer the Vermont Organics brand of apple butter because it is so cinnamony and clovey. 1. Preheat the oven to 350°F and lightly grease a 9-inch deep-dish pie plate. 2. Make the crumble topping by mixing together the crumbled cupcakes and the brown sugar. (I like to use my hands to work these two ingredients together because it is easy and ensures that the cupcakes get evenly coated with the sugar and shortening.) Cut in the butter-flavored shortening until clumps form. Place the crumble topping in the refrigerator until ready to use. 3. Toss together the apples and the salt in a large mixing bowl. Melt the shortening or margarine in a large skillet over medium-high heat. Add the sliced apples and sauté for about 3 minutes or until the apples begin to soften. 4. Meanwhile, in a small separate bowl, whisk together the cornstarch and water until they are smooth. Add the cornstarch mixture to the apples. Stir to evenly combine them. Continue cooking for another minute or until the cornstarch begins to thicken and the apples are soft. 5. Remove the apples from the heat and fold in the apple butter and the raisins or dried cranberries. Spoon the mixture into the prepared pie plate and top with the crumble topping. 6. 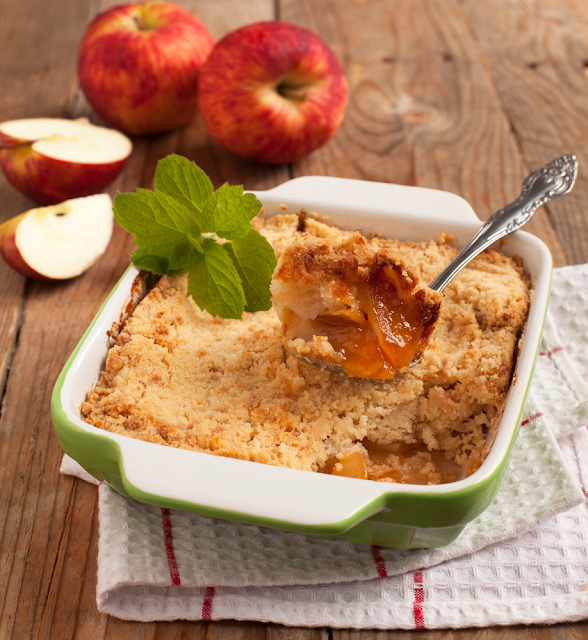 Bake the apple crumble in the preheated oven for 40 minutes. 7. Remove from the oven and let the crumble cool. The crumble can be served warm or room temperature. 8. Leftovers may be refrigerated in an airtight container for up to three days.